The game of football has long been lauded as being a vehicle in which young players have been able to grow and hone not only their athletic skills, but also those they will need to succeed in life. Grit, determination, teamwork, leadership — all of these lessons and more are fostered by the game of football. Few know this better than Senator Cory Booker. 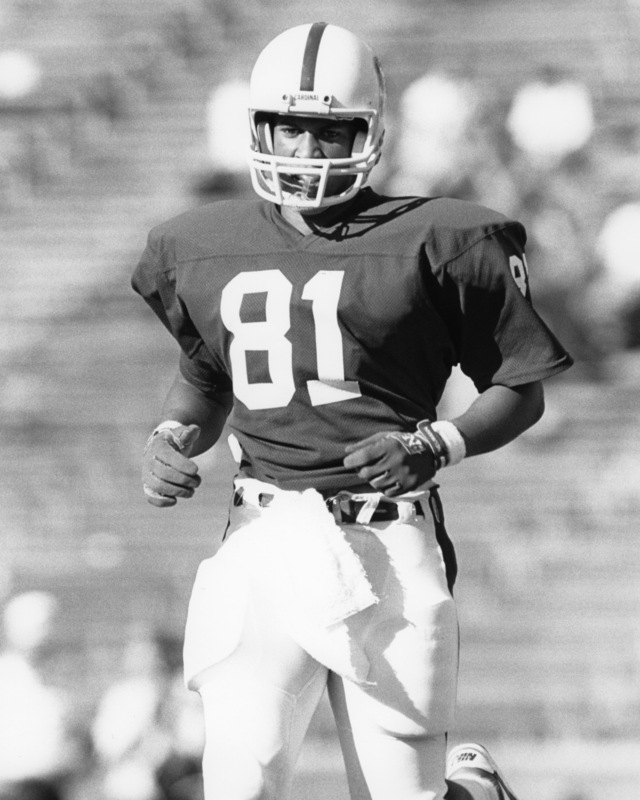 As a junior senator from the state of New Jersey, Booker has credited his love and tenure in the game of football for much of his success. His résumé of success and excellence is lengthy. His profile on the national stage is profound and his star is still on the rise. Prior to becoming a United States Senator, Booker was the Mayor of Newark, New Jersey, a Rhodes scholar at Oxford, a starting tight end at Stanford University, and a high school All-American at Northern Valley Regional High School at Old Tappan in Bergen County, New Jersey. It is these beginnings in the game of football, again, that he has personally credited with opening the door to his current success and perhaps even greater success in years to come. EM: Senator, thank you for taking the time out of your busy schedule to talk with us today. You grew up in one of the underrated hot beds of football in the country in New Jersey. When did you first begin playing organized football? BOOKER: I started playing as a high school freshman at Old Tappan High School in New Jersey. I joined the freshman team and that was the first time I ever put on the pads and helmet. EM: Considering how successful your high school career was, that was a little bit of a late start. What was behind you starting when you did? BOOKER: In my small town, they really didn’t have organized football, so I played soccer and baseball and basketball. I dreamed of playing football and it was the sport I loved to watch the most. So, as soon as I got to high school, I had an older brother who was playing, and he had already sort of convinced my mom to play so that opened the door for me. EM: Once you got the pads on, how long was it before you really fell in love with the sport? BOOKER: I’m telling you, it was [that first] summer when we were all working out together, and before we put the pads on, I was in love with the camaraderie, the fellowship. That kind of bond, it just felt like we were a band of brothers and I fell in love with that right away. EM: When did you realize you were good enough to play at the next level? BOOKER: I was a big kid at 14, so I took to [football] really naturally, just feeling the excitement about it. Even as a freshman, they pulled me up to JV and it was a great experience. It just started right away, getting the opportunities to lead. I was elected one of the captains of the team and for me, it was some of the most formative experiences of my life as a 14 and 15-year-old. EM: How did the decision to go to Stanford come about? Obviously, they have a great tradition in football, but considering the accolades you had coming out of high school, I would think you could have gone to any number of more ‘traditional’ football powerhouses. What was it about Stanford that made you want to go there? BOOKER: I always joked that I got into Stanford because of a 4.0 and a 1,600. I average 4 yards a carry and had 1,600 yards rushing. It would’ve been a reach school for me to get into without football. But, because I was the most overrated high school player in that year as a high school All-American, it opened up that door. I’ll never forget that that year, U.S. News & World Report academically ranked the colleges and they ranked Stanford over Harvard and Yale as the number one academic school in the country. That sealed it for me. I was like, if I have a chance to get a football scholarship to the top academic school, I’m going to take that opportunity because even back then I realized that football was going to be my ticket and not my destination. EM: I have read in previous interviews that you don’t consider your tenure with the Cardinal a success. 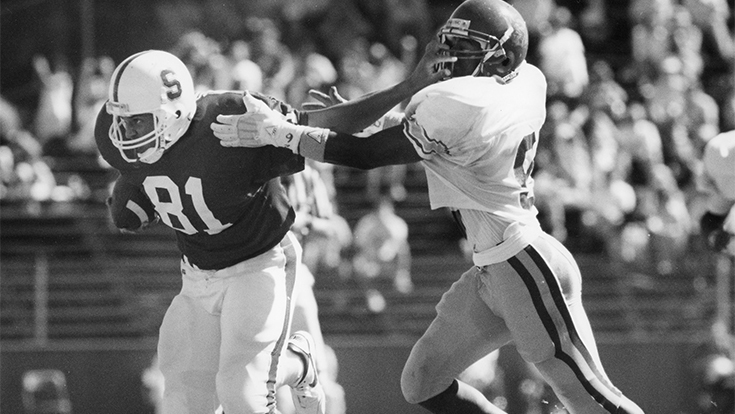 With that said though, do you have many fond memories of playing there at Stanford? BOOKER: Oh my God, so many great memories. First of all, I just had a great coaching staff with everybody from Brian Billick to Dennis Green and great classmates and players. Again, it was another band of brothers, they were people that I just feel so grateful to and so close to. And then, just the chance to play on national TV in South Bend, Indiana, and to win and to grab a number of passes against the No. 1 team in America and to help your team get a victory like that is incredible. Also, to catch a touchdown against USC, to beat Cal-Berkeley time and time again, these are memories that I’ll never forget. But, even more than that frankly, was proving to myself that I could do it. That I could compete at the top level of football and in the classroom. I think that what football did for me was show me that the only limits on my potential were limits that I put on myself. Even if I was putting in 50, 60, or 70 hours a week in a rough football schedule, I could still get A’s. Football made me believe that if I focused in on my goals and sacrifice and put in the hard, hard work that there was nothing I couldn’t accomplish. EM: Knowing that you didn’t have the aspirations of competing at the professional level, did you have a plan for what you wanted to do once you were done playing football? BOOKER: Yeah, you know, I did get letters to come out to the combine and I tried to envision myself doing that. The reality was that I knew I wanted to continue my education. When I got an opportunity to get a Rhodes scholarship, I knew that I was going to go on to graduate school. I know I wouldn’t have been a Rhodes scholar if it wasn’t for the contributions that football made to my college career. Football was not a ladder, it was a jetpack that lifted my life to opportunities that were beyond my dreams just five-to-six years earlier. EM: That’s a perfect way of saying that. I know your schedule is pretty ‘hectic’ to say the least these days. Do you still have time to watch football on Saturdays or Sundays during the season? BOOKER: I tell you, watching Monday Night Football [with the Kansas City Chiefs against the Los Angeles Rams] was one of the greatest games I’ve ever watched. Having played the sport, you watch it with a little bit different perspective from someone who didn’t do it and it charges me up. It inspires me to see such gifted athletes out there and knowing some of the struggles that they’ve had to go through and know some of the discipline they’ve had to use and the challenges they’ve had to overcome. I definitely try to watch games when I can and I’m definitely a huge, out-of-control Stanford football fan. EM: If you had to pick just one lesson or skill that you learned while playing football that you still use every day, what would that be? BOOKER: It’s the profound power of unity. When we were driving on offense, as soon as I heard the defensive huddle start arguing and yelling at each other I knew we were going to score a touchdown. There’s nothing that can take a football team, a community, a church, a country down as fast as disunity and people fighting among themselves. Even the book I wrote was called “United.” I think the greatest calling for us is to remember that we’re one nation, under God striving always for indivisibility and those are values that I take from football.